Red Racer brings back the popular Lime Margarita Gose in time for spring in a new format and updated packaging. 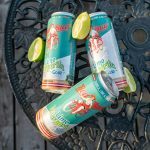 Inspired by the beaches of Mexico, and made with real tequila, the Red Racer Lime Margarita Gose is a craft beer take on the classic margarita cocktail. Last year the Lime Margarita Gose sold out quickly, leaving many clamouring for more. This year expect this tasty warm weather refresher to be around until September! Part of the Red Racer ‘Spirited Series’, the Lime Margarita Gose fuses an innovative craft beer style with high quality spirits to create a unique beer and spirits infusion. 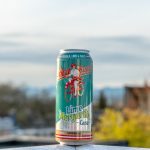 Red Racer’s Lime Margarita Gose will be available starting the second week of April in 4-packs of 500mL cans throughout BC and Alberta, and New Brunswick. Starting this week cans and draught will be available at all Red Racer and Central City locations, with cans showing up in stores starting the week of April 8th.